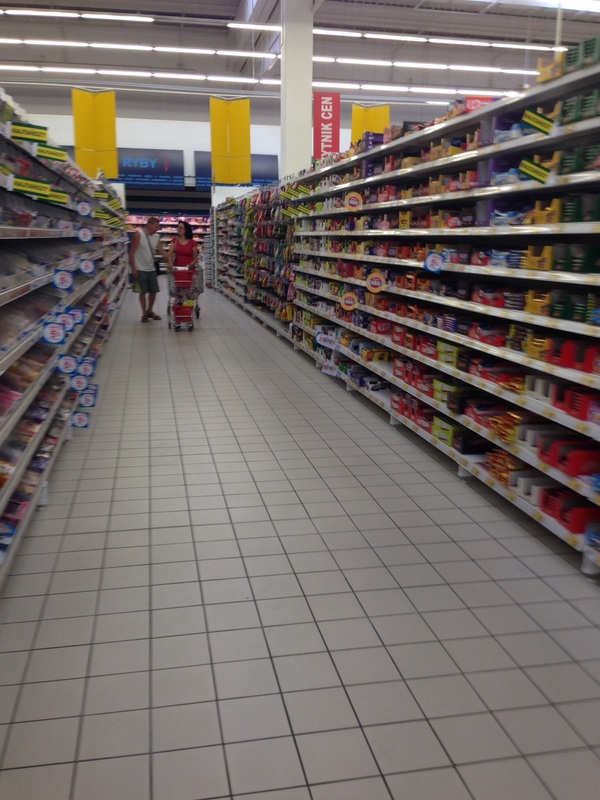 Let’s learn about grocery shopping in a foreign country. If you can’t read the labels and don’t want to stand in the aisles all day with your Google Translate App trying to figure out what the heck you’re buying…You look at the pictures. They say a picture is worth a thousand words and this is true when you can’t read the language. It could be the difference between you taking home a can of tuna or a can of picked herring. My piece of advice for anyone moving to a foreign country is to learn what all the herbs/spices look like because everything that is leafy and green starts looking the same as you stare at rows and rows of packets of spices. 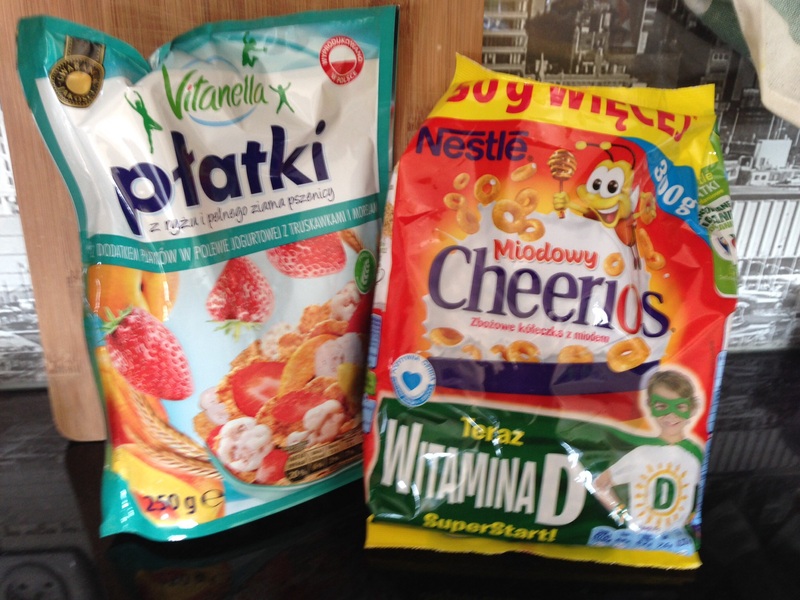 Don’t expect to see certain items that you might see in every grocery store in the US in the grocery store in Poland. Even if you diligently search every aisle. Saltine crackers for instance. Don’t exist here. These are about the only crackers I’ve seen and they are a cross between a ritz and a wheat cracker. Taste good though! And you must search every aisle for some items because you never know where you’ll find them. For instance tortilla chips (the one brand they carry) are not with all the rest of the snacks & chips, they are in the international food section. BBQ sauce that is abundant in the US with all kinds of brands and varieties is also an international food, but you will find only 3-4 bottles in the entire store here. 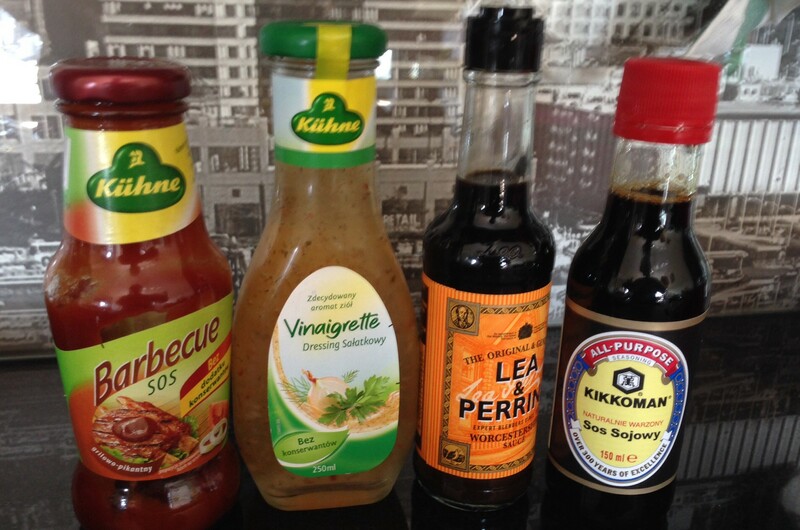 And things you might find one day, like the BBQ sauce, the next time you shop….nada…nothing. It’s like they were token bottles to tease the few Americans that might actually buy it. Same with cheddar cheese. I saw it once and bought some. I haven’t seen it again since. With the exception of stores like Auchan & Tesco which are like a Walmart or Target Superstore, the grocery stores here are small neighbourhood stores….and they are everywhere like 7-11’s. The two closest to me are Fresh Market (yep the name is in English…but they don’t speak English in there!) which is more like a small convenience store where you can pick up milk, bread, a little produce and it also has small deli. The slightly larger store called Biedronka (it translates to Ladybug…hence the store logo) is a scaled down version of a big grocery store. Just basic items for everyday living. The one in our neighbourhood is about 2 blocks away and it’s tucked away in an alley. If you weren’t looking for it, you’d never see. To give you an idea of the size, it’s has 3 aisles. I’m standing about 1/3 of the way down the first aisle. Behind me is the small produce section and bakery/bread items, the rest is cheese, meat & cookies. The next aisle is candy, frozen food, canned veggies/lots of jars of pickled stuff – cabbage, beets, herring, stuff I don’t even recognize. 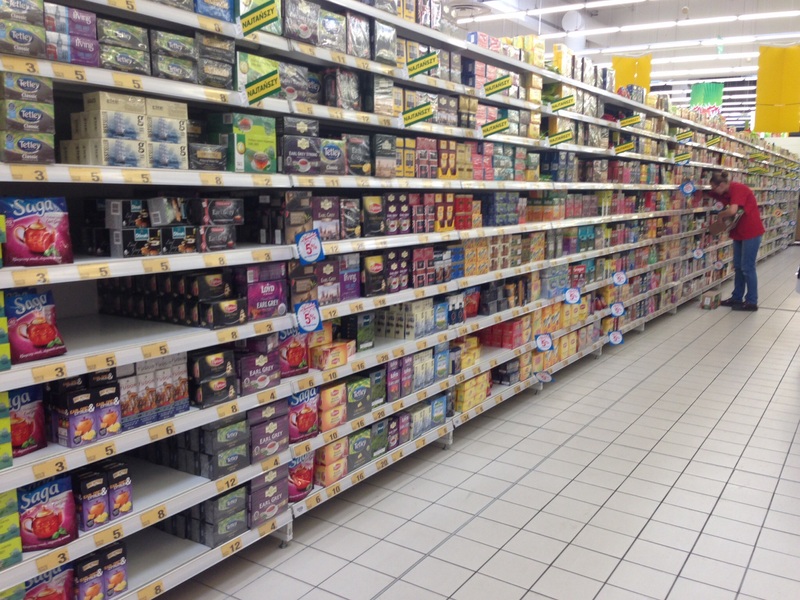 Along the back is milk and more dairy products & cheese…hundreds of varieties of gouda, but no cheddar. And the last aisle is paper products, laundry & cleaning, soda, beer and liquor. They do sell meat here, which seems to be very good quality. When you buy meat, you have to look at the picture so see what animal it comes from. What looks like ground beef, could be beef or pork, or turkey or a mixture of any of them. Just to let you know, the ground beef/pork mixture does NOT make good taco meat. It’s edible, but has a very peculiar taste. Don’t expect anything to come in a big size….no super-size stuff here. In fact you really only get one size to choose from…SMALL. Small jars of everything. These might look normal size, but they are only about 6 inches tall. Yes, they do have some familiar brands. Don’t be fooled by that Vinaigrette dressing (it’s one of four varieties they sell. (vinaigrette, thousand island, mustard vinaigrette and possibly ranch…haven’t figured out that label yet.) But this one…I don’t think there is any vinegar in it….it’s basically oil with some spices floating in it. Small sizes includes milk too. 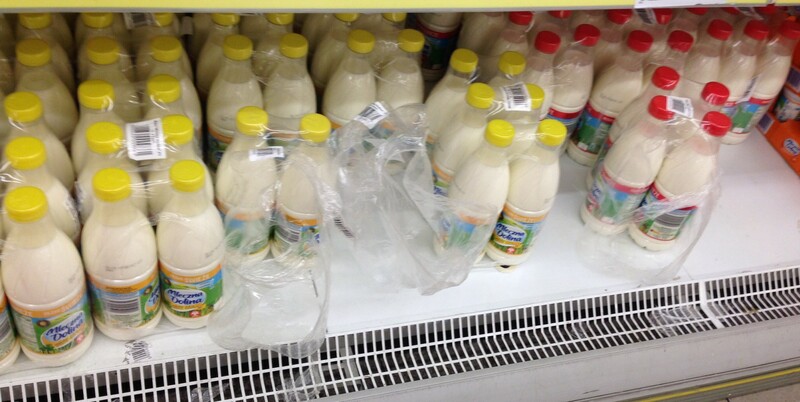 All the milk I’ve seen comes in the same size one liter plastic bottle – but you can buy it in a six pack! Looking for a dozen eggs? Won’t find that either…they come in cartons of 6 or 10. If you’re looking for anything in a box here, you’re mostly out of luck. 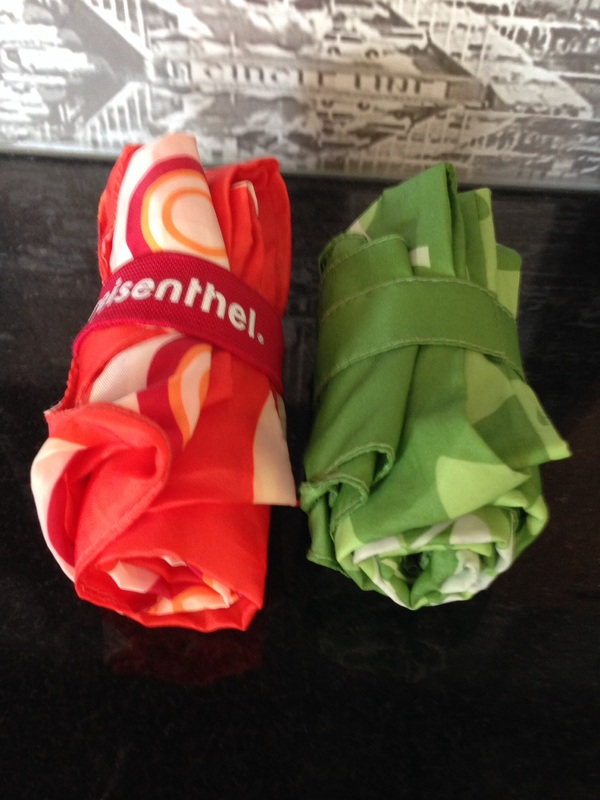 Not only do things not come in boxes – they come in pouches…all sizes of pouches. Cereal? In a pouch, Jello or pudding mix? In a pouch. 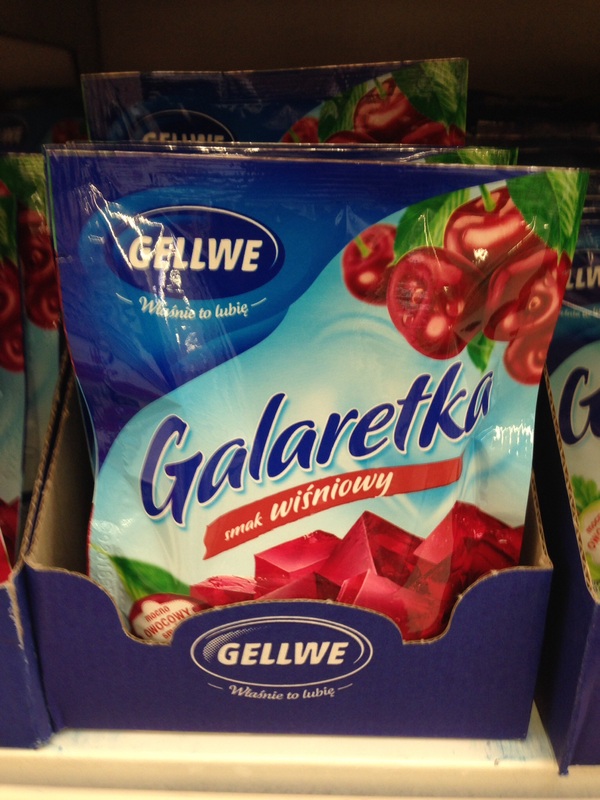 See the picture?…cherry flavoured jello. Little jars of spices? Nope, In a pouch. Cake mix? In a pouch. Pouches can be good, but these aren’t Ziploc type pouches, so you can’t seal anything back up. And a lot are made of very. thin. super. thin. material. One small tear and the whole thing is coming apart. If you’re not careful, you’ll be wishing you had a dog to eat up all the cheerios that are now on the floor. Let’s get back to shopping and boxes. Tea and Coffee come in boxes. There are boxes galore. An entire aisle full of boxes. (See that worker? He’s standing about 1/2 way down the aisle) and it’s ALL tea! The boxes (not bags) of coffee are on the other side of the aisle. The entire seemingly endless aisles is all tea and coffee. And the candy! Let’s take a moment to check out the candy. If you have a sweet tooth, you must move to Poland. Immediately. I’ve never seen so much candy at the grocery store. They just don’t have it at the check-out counters….they have aisles full! 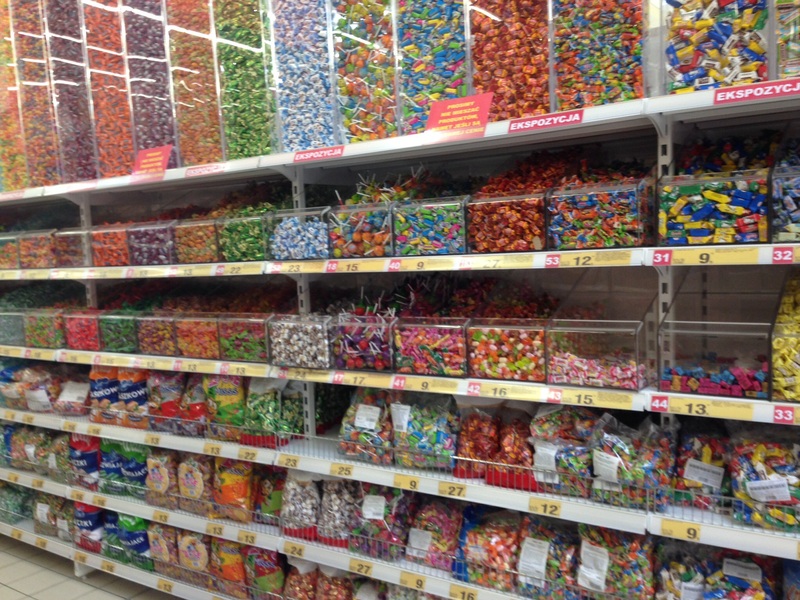 Both sides of the aisle below is all candy…and I’m standing part way down too. And it’s not just here either. They sell it in bulk too! It’s a diabetic’s nightmare or a small child’s dream come true. 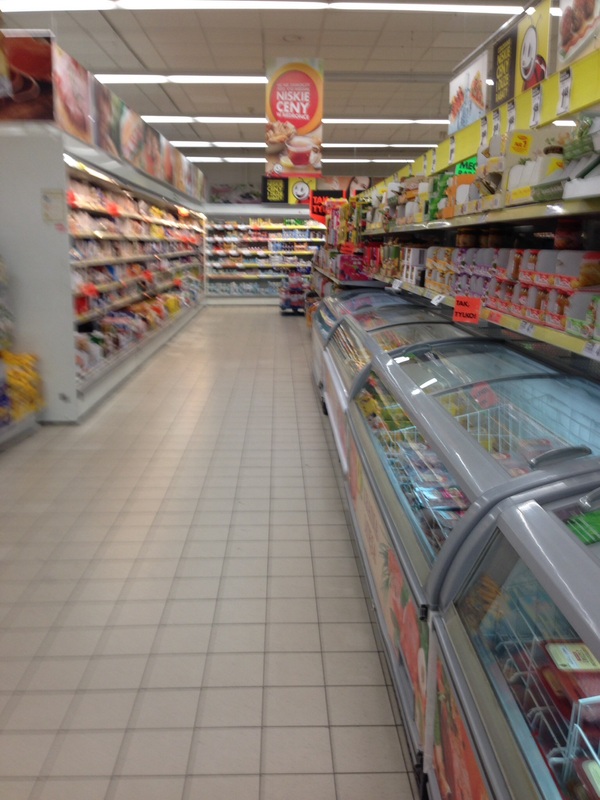 This is just a small section of the aisle…it’s as long as the other ones. Most of the other aisle above is chocolate, this aisle is everything else. 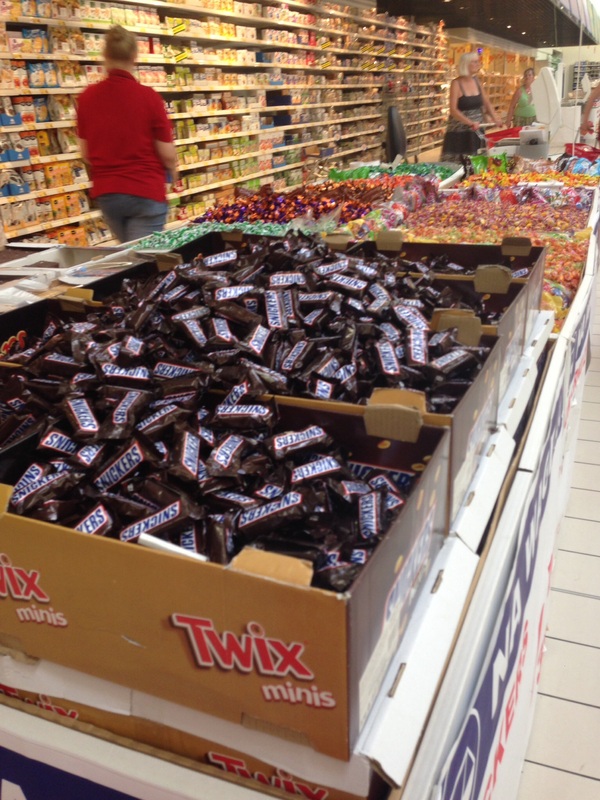 There are some candy bars you’d recognize, but very few…twix and snickers seem to be popular. Ever seen Snicker’s bars sold in bulk? You have now. Now let’s talk soup. Where do you think you’d find cans of soup? In America, that’s where. No use trying to find one here. I have yet to see a can of soup and I have looked in every grocery store, big and little. The Soup Nazi on Seinfield must have been Polish…”No Soup for You!” What soup they do have comes in…what else but pouches! Dry mix pouches. Or else it’s in little instant cups. You would think that with the cold Polish winters they would be eating lots of hearty soup….but I guess they make it all from scratch. If you know me well you know I am not a soup eater…unless I am deathly sick and then I’ll succumb to making Lipton Chicken Noodle Soup (yep, the dry mix kind) just to keep me off my death bed…although I do like Panara’s Broccoli Cheddar on a cold winter day. David however LOVES soup. Guess I’ll be looking up recipes online to make it from scratch. Back to shopping. 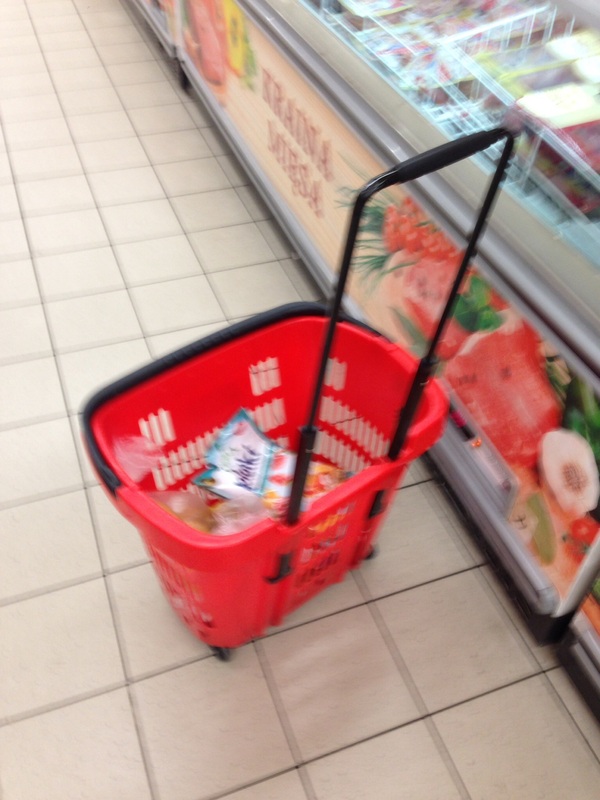 But the best part of shopping is that they have better ways in Poland to “carry” your groceries around the store. When you are only buying a few things at a time like most people do here, you can get a hand basket…like the ones we have in the US, a little bigger –but with wheels! (excuse the fuzzy picture….It’s hard to be inconspicuous taking pictures in the store, especially when the security guard is watching you. No more dents from the handle digging into your arm when you’re carrying heavy items…you just wheel your food through the store! The Biedronka has this kind. 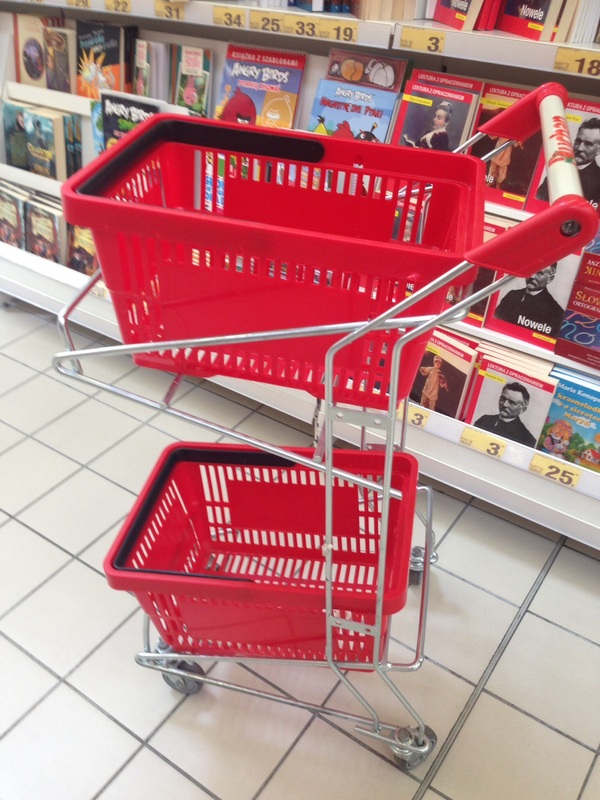 If you want to go to Auchan — you can get two baskets and a little rolling cart to carry them for you! Or if you are in for a big shopping spree…or are buying a six pack of 2 liter bottles of water like we do, you’ll need a bigger cart. 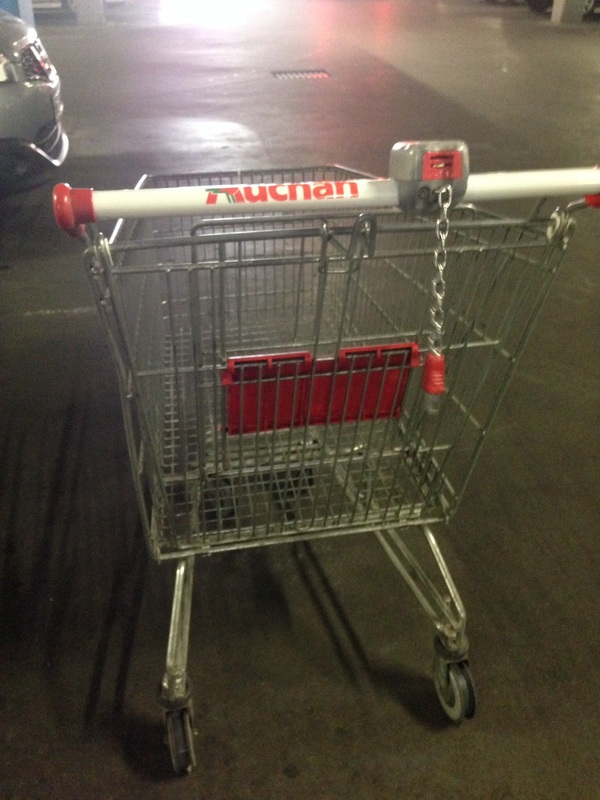 You “pay” for your cart by inserting a coin (either 1 or 2 zloty) and then it will unlock from the rest of the carts. When you return your cart, you lock it back up and get your money back. You won’t find stray carts all over a parking lot here looking for a car to dent. And no need to worry about how you’ll get that cart down to the parking garage when the store is on the second floor of the mall. Use the escalator – they look like ramps, not stairs. Yes, David goes shopping with me…he’s my muscle for carrying the water! 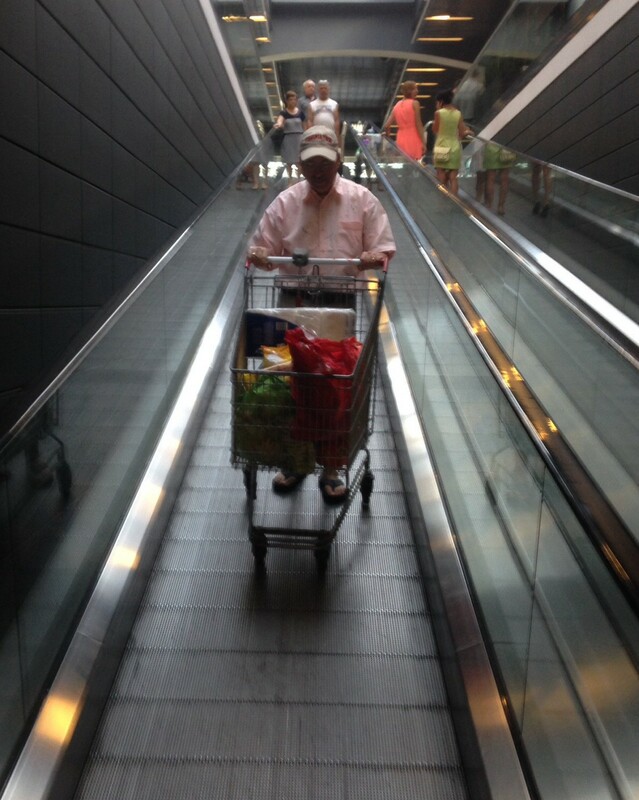 All the escalators here are like this…just don’t let go of the cart on the way down….wouldn’t want to mow anyone down. And don’t forget your bags! The stores charge for bags, so most people carry their own. 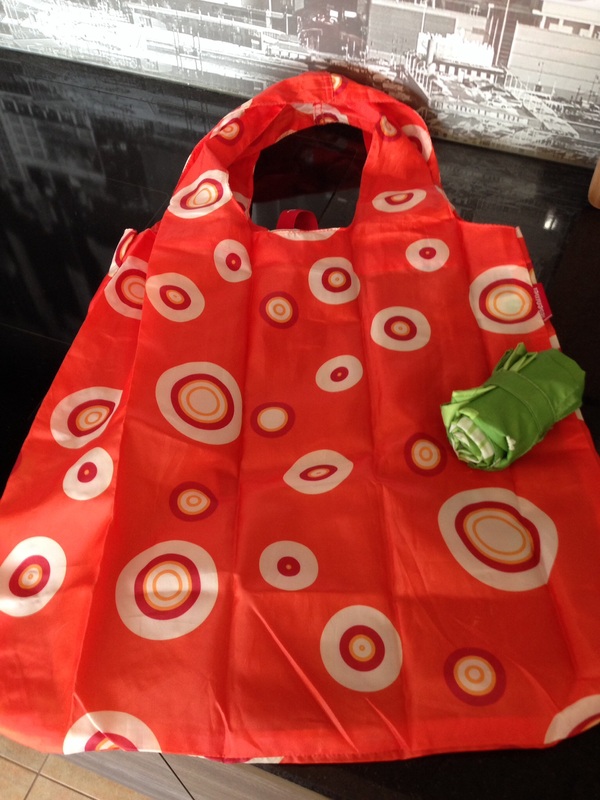 I bought these in Seattle several years ago and they work like a charm…I just keep them in my purse, so I’m always ready to shop! All this talk of food and shopping has made me hungry. I’m going to go get a snack. Maybe some popcorn…but remember no boxes. Popcorn comes in a pouch too….each one is sold individually.